The Maryland Eastern Shore Life! While you are visiting Easton, Maryland, stop by Albright’s Gun Shop to pick up a free HOMES guide, featuring the latest real estate listings for the Eastern Shore. 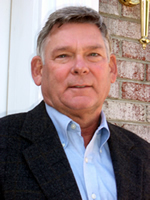 If you are thinking about buying or selling property, let Larry Albright, a local business owner who knows the area and the people, help you with your real estate needs. Larry is an active member of the Eastern Shore community and is Chairman of the Board of the Chesapeake Wildlife Heritage. His store, Albright’s Gun Shop has remained in the forefront of community news and events. It is because of his participation in many local organizations that he realized he could further his community involvement through real estate. His experience includes estate homes, waterfront properties and hunting farms on Maryland’s scenic Eastern Shore. Let someone who understands your vision for your next home guide you through the buying and selling process. Larry, a successful business owner, knows what it takes to achieve dreams, and stands ready to help you find yours!